It took about an hour for Bliss to carefully “propagate” our new Mansion Geranium Garden, Sylvie (back left) already has her eye on the plant she likes, it has a white circle on one of the leaves. Madeline is eager to have a plant in her room. 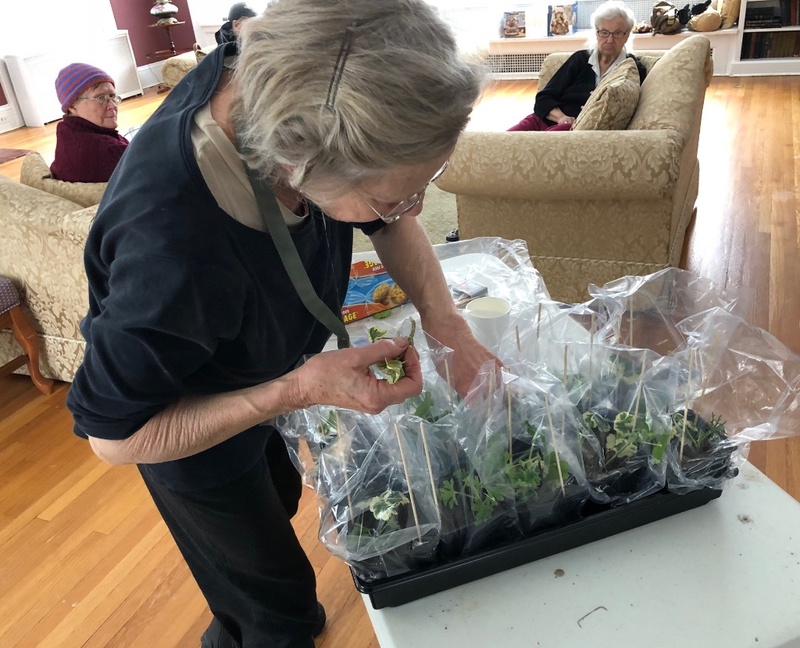 Bliss turned each small planting tub into a greenhouse, she put two wooden sticks in each planter to hold up the plastic bag she put over the top. The humidity from the bags will help the Geranium cuttings grow. We finished the first try and put it in its new home near the door, we will come back to make a second tray. I was excited by Bliss and her wonderful feel for the plants, she let me plant two and I loved the feel of them going into the soft dirt. I might adopt one myself if there are any left to adopt. And I will keep an eye on them all. By Spring, we’ll have some beautiful flowers to hand out or to plant in the Mansion Garden. We think this might make it as an annual event. Thank you, Jon for sharing another nurturing event for The Mansion residents. This post reminds me of the process employed by The Eden Alternative to nurture our elders in the hope of preventing loneliness, helplessness and boredom. Good on You! Thank you for making our world more wonderful! Thanks Brenda, they do love to nurture, living things around them are so important..